Be the first to share your favorite memory, photo or story of A.. This memorial page is dedicated for family, friends and future generations to celebrate the life of their loved one. 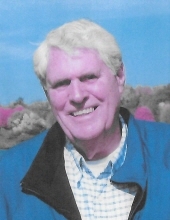 BORDEN, A. Robert "Bob" - Age 87, of Fenton, passed away Tuesday, February 5, 2019. Services will be held 1 PM Saturday, March 2 at Sharp Funeral Homes, Fenton Chapel, 1000 Silver Lake Rd., Fenton. Chaplain Goodman Cox officiating. Interment will be in Rose Township Cemetery at a later date. Visitation will be held 11 AM until the time of service. Those desiring may make contributions to the American Cancer Society. Bob was born September 15, 1931 in Reading, Pennsylvania the son of Arthur R. and Gertrude P. (Ormiston) Borden, Sr.. He married JoAnne Courtland Amador on May 25, 1990. Bob was an independent Forensic Building Inspector who was frequently contracted by UAW Legal Plan to provide expert consulting services and litigation support. He frequently acted as an Arbitrator with the American Arbitration Association. Bob was an avid fisherman. He enjoyed RV camping, reading, and stamp and coin collecting. He also loved antiquing and auctions. Surviving are: his beloved wife, JoAnne Amador-Borden; daughters, Tracy (Malloy) Farley, Kelli (David) Borden-Moore; step-children, Art (Glenda) Amador, Deanna Wilson, Judy Amador, Jeff Amador, Christina Vrabel, Robbin (Jeff) Carson; grandchildren, Colin Moore, Leigh (Rich) Coburn, Shaun (Kristen) Wilson, Troy Amador, Ryan Amador, Carla Amador, April (Brian) Aiosa, Alisa Carson, Eric (Laura) Vrabel; 6 great-grandchildren; sister-in-law, Phyllis (Paul) Ruzgis; brother-in-law, Jack Courtland; and several nieces and nephews. To send flowers or a remembrance gift to the family of A. Robert "Bob" Borden, please visit our Tribute Store. "Email Address" would like to share the life celebration of A. Robert "Bob" Borden. Click on the "link" to go to share a favorite memory or leave a condolence message for the family.